Just listened to this amazing podcast from fitness trainer Chalene Johnson about Superbowl Sunday! 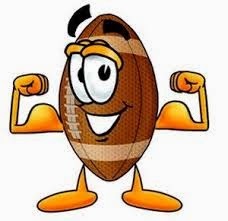 There is research that supports people who watch football, gain significant weight during football season, especially on one particular day......SUPERBOWL SUNDAY. We do not have dinner during games, we SNACK THE ENTIRE GAME! And most of us drink to go along with it. It is crazy the amount of food people eat during the season and on Superbowl Sunday. What did the study find?? -Superbowl Sunday is the 2nd biggest day of the year for food consumption in the US. 1st being Thanksgiving. beer and pizza sales skyrocket! IT IS A DANGEROUS HOLIDAY!!! TONS AND TONS OF MINDLESS EATING!! Fun fact: The #1 day people start their new years resolution diet??!! OK WE NEED A GAME PLAN! 2. Drink lots of water- Another obvious one! 3. Be prepared- If you are going to a party, bring food for yourself! If not, you will be sorry. 4. Avoid the dips!- TONS of CALORIES AND FAT! Try hummus, salsa, pure guacamole! And be aware that it sits out for hours, with tons of dirty fingers in it! 5. Sit and Chat with other health and fitness lovers.- CONQUER the temptations together! 7, Get your food last, help others, get food for the kids- KEEP BUSY! BE GOOD AND KNOW THAT BITE OF FOOD WILL NOT FEEL GOOD AFTER THE FACT. LET'S MAKE IT A NO REGRET SUPERBOWL SUNDAY!! !